There's nothing more comforting than a delicious shepherd's pie with creamy mashed potato and lots of seasonal veggies on the side. It's always been one of my favourites and I used to enjoy it made with vegetarian mince but since going plant based I needed a more nutritional twist. 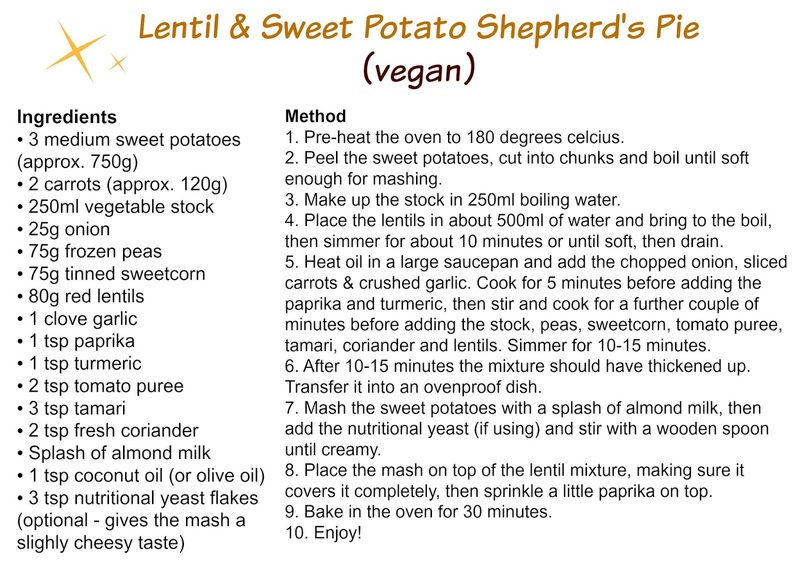 I tried making a shepherds pie with lentils and it was a total game changer - I actually way prefer it, especially topped with sweet potato! This lentil shepherds pie is the ultimate comforting, hearty, filling meal that will satisfy the vegan and the meat eater. It's bursting with such wonderful flavours due to spices and tamari and the peas, sweetcorn and carrots that accompany the red lentils give this dish the best texture and taste you could imagine. The addition of sweet potato on top instead of regular potato is incredible, I just find it goes with the filling perfectly and provides your body with a load of goodness. Lentil's often get a bad reputation but when they're cooked with spices like paprika, turmeric and garlic it transforms these little beans into something special. Lentils are packed full of goodness too, so you can enjoy the taste of this hearty meal whilst knowing you're doing your body good. Lentils contain masses of fibre which is good for keeping you full and aiding digestion. They are brilliant for your heart too, this is not only due to the fibre but they also contain signifiant amounts of folate and magnesium which both really help keep your precious heart happy and healthy and lower cholesterol! Lentils will also stabilise your blood sugar levels and give you energy as they provide your body with slow burning complex carbohydrates and vital iron too. Lentils are also a protein powerhouse, they contain the third largest amount of protein of all the legumes and nuts. This meal will provide your body with so much nourishment with every bite that you'll feel magical afterwards and your taste buds will be dancing!